The ceremony will be chaired by the rector of the church and the Moscow Patriarchate’s representative to the Council of Europe Hegumen Philip (Ryabykh) and Strasbourg mayor Roland Ries, the parochial press service reports on Monday. 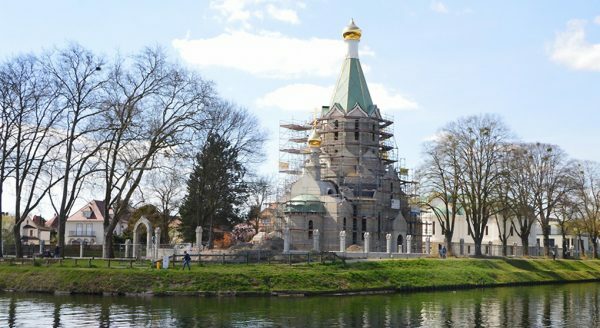 The center will house the Representation of the Russian Church to the Council of Europe, a conference hall, residential and utility premises. Golden dooms made in Moscow were set up on All Saints Church in March. The idea of building the church appeared after establishing the Parish of All Saints in 2003 and the Representation of the Russian Church at the Council of Europe in 2004. It took several years to negotiate with the city authorities on allotting land, to work out the project of the church, to register all necessary administrative and engineering documents. In 2011, Strasbourg authorities allotted land on the bank of the Marne Canal flowing into the Rhine River where the Orangerie city park and European International institutions such as the European Council, the European Court of Human Rights, and the European Parliament are located. The permission for building was gained in 2012, and the agreement on renting land for 99 years was signed in 2013. Alongside with it, private persons and commercial structures were urged to fundraise to start building works. The community has rented a former garage for celebrating liturgies since 2007. Today, the garage premises do not answer demands of the parish, as the number of its parishioners grows every year.